Sankey diagrams are used to display different flows and the flow quantities in proportion to one another. 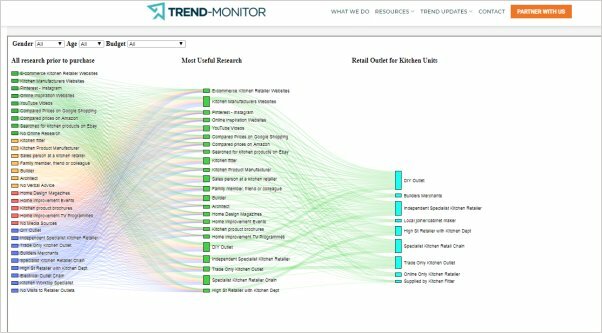 At Trend-Monitor we have used a Sankey diagram to demonstrate the relationship between research prior to purchase and choice of retail outlet. Our diagram indicates how consumers progress from researching via numerous research resources, through to what they considered the most useful research resource, and then where they purchased their kitchen from. The width of the lines (or arrows) used in the chart indicates the amount of flow, so the thicker the line – the larger the quantity of flow. Flow lines can combine together or split through their paths on each stage of a process. Colour is used to divide the diagram into different categories or to show the transition from one state of the process to another. If you are one of our Kitchen Interactive Insight Partners, you can view the full chart here and filter the data according to age, gender and budget.